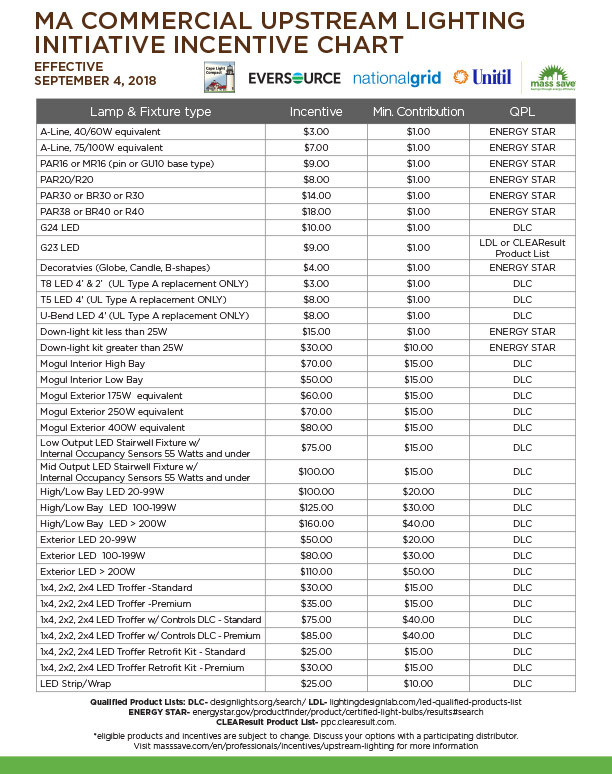 The Massachusetts Program Administrators of MassSave have partnered with electrical distributors to offer contractors and LED lighting distributors discounted pricing on LED retrofits (such as LED lamps and select types of LED fixtures) in commercial applications. Program incentives are provided directly to the LED light distributor by the Program Administrators: Cape Light, Eversource Energy, National Grid, and Unitil. Eligible lamps can only be purchased through participating dealers such as NES Lighting Distributors. A minimum customer contribution is required for any lamp or fixture sold through the Bright Opportunities Lighting Program. Minimum customer contribution is located on the incentive chart. All product must be installed within 30 days of receipt.